Small and shiny star-shaped items. Grants an extra life every 50 (in Super Mario Galaxy) or 100 (in Super Mario Galaxy 2) collected, spawns a Launch Star if fed to a Hungry Luma, able to shoot at enemies to temporarily stun them. Star Bits are common collectible items first appearing in Super Mario Galaxy. They come in many colors (red, yellow, green, blue, purple, and white), and are quite shiny. In Super Mario Galaxy and Super Mario Galaxy 2, they give the player extra lives when a number of them are collected. They are also used to feed Hungry Lumas and stun enemies. Rows of Star Bits in an airship's secret area in the Space Junk Galaxy. Star Bits appear in Super Mario Galaxy and Super Mario Galaxy 2 and are first introduced in the form of small rocks from space, landing when Mario arrives at Princess Peach's Castle at the beginning of the game. To collect them, the player can move the Star Cursor over them or simply run into them. For every 50 (Super Mario Galaxy) or 100 (Super Mario Galaxy 2) Mario collects, he receives an extra life. Mario will keep collected Star Bits after losing a life in a stage, but he will lose his coins. After completing a mission, Mario's Star Bits are added to his total amount. The stored Star Bits are then used to feed the Hungry Lumas found in the Comet Observatory and several galaxies to unlock galaxies and planets. In Super Mario Galaxy 2, they are also used at various points in the different Worlds and to spin Chance Cubes on Starship Mario. They can also be used to feed other Lumas, without any gain. Pressing the button will shoot a Star Bit at the location of the Star Cursor. This can be used to stun or defeat some enemies. If a player holds the button, Star Bits will be shot continuously. Fired Star Bits cannot be recovered. The average enemy, such as a Goomba, will release three Star Bits when defeated. However, that will only happen if the Star Spin is used, as simply jumping on one produces a single Coin. This holds true for most, but not all enemies. For example, Magikoopas only release Coins no matter what method they are defeated by. Mario can also make Star Bits appear by Ground Pounding certain buttons or activating Flipswitch Panels in various galaxies. Note that this will not always happen, as each button or Flipswitch Panel performs a different function depending on its galaxy and location. There is a larger object thought to be somewhat related to Star Bits called the Star Crystal, many of which are normally seen in Launch Star paths. They are broken upon impact and produce at least six Star Bits that Mario must collect quickly before they fly away. Star Bits also appear in Super Mario 3D World. Here, they appear in the background of all special worlds (Star, Mushroom, Flower, and Crown), serving no real purpose. Star Bit-shaped regional coins in Super Mario Odyssey. In Super Mario Odyssey, regional coins are in the shape of Star Bits in the Moon Kingdom. Star Bits appear in Rainbow Road, on various parts of the track. They are absent in split-screen mode. Star Bits also appear in Mario & Sonic at the Olympic Winter Games, in the Dream Ski Jumping event, which takes place in the Good Egg Galaxy. They add points to the player's score. Star Bits are used as Rosalina's side special move in Super Smash Bros. for Nintendo 3DS / Wii U and Super Smash Bros. Ultimate, which is called Star Bits. When used, Rosalina commands the Luma to shoot a small number of Star Bits. It is a long-ranged attack that cannot be absorbed or reflected, thus not making it a projectile attack. Nothing will happen if a Luma is not present when Rosalina uses this move. In the Nintendo 3DS and Wii U installments, the move has two variations that can be swapped out once the player unlocks them. Floaty Star Bit is a large Star Bit that is slow and gets in the way of fighters. Shooting Star Bit shoots only one Star Bit, but has longer range and more power. Unlike the default variation, these two variations are considered projectiles, and can be reflected or absorbed. In Mario Party 10, Star Bits are exclusive to the amiibo Party on the Rosalina Board. They appear in Crystal-like recipients. When the player lands on an Event Space, the Star Bits inside the recipient fly out and fall in the center of the board, where they have to be quickly collected with the cursor within five seconds. They can then be exchanged for an equal amount of Coins. 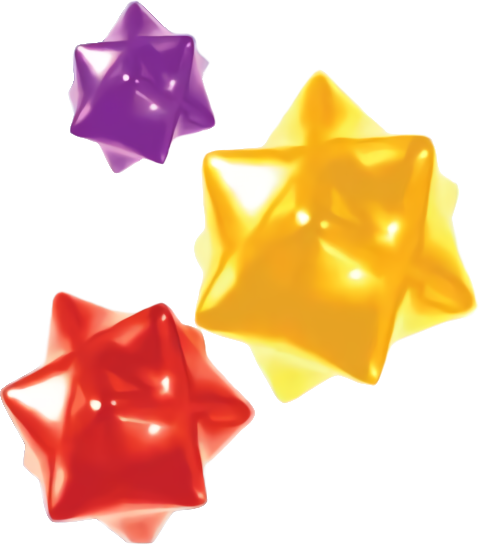 During development, Star Bits were originally known as star shards. In Super Mario Galaxy and Super Mario Galaxy 2, if 9,999 Star Bits are collected, all coconuts in the games will become watermelons permanently, even if the Star Bit total drops below 9,999 again. In Super Mario Galaxy 2, if the player has 777 or 7,777 Star Bits on hand while on Starship Mario, Lubba will remark on how lucky that is, which is a reference to the saying, "Lucky 7." He also has messages for having 9,999 and multiples of 1,000 of them on hand as well. Star Bits are modeled after the Japanese centuries-old candy Konpeitō, which is primarily made from sugar. Konpeitō had previously appeared in the franchise in Super Mario RPG: Legend of the Seven Stars, localized as Rock Candy. In Rosalina's Storybook, Star Bits are said to taste like honey. The minimum amount of obtainable Star Bits for Super Mario Galaxy is 106, due to the objective of Good Egg Galaxy's second mission, a Star Bit which is unavoidable in the final mission of the game, and the Star Bit tutorial. For Super Mario Galaxy 2, the minimum is 8, due to the Star Crystal on the Grand World Map blocking the second half of World 2. ↑ CMeeCraft Gaming. (November 26, 2018). Super Mario Galaxy No Star Bits Gameplay -Full Playthrough. YouTube. Retrieved December 8, 2018. ↑ Is It Possible to Beat Super Mario Galaxy 2 Without Collecting Any Star Bits? No Star Bits Challenge. YouTube. Retrieved January 2, 2019. This page was last edited on March 21, 2019, at 21:38.